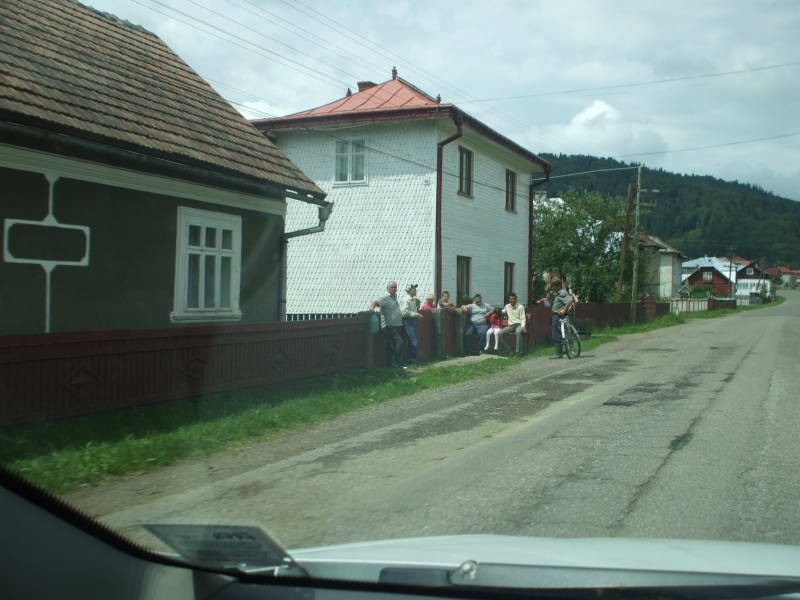 The next stage of our trip was from Gura Humorului in northeastern Romania near the Ukrainian border, to Sighişoara in central Romania, in the region of Transylvania. This is part of the Athens to Paris by Train series. 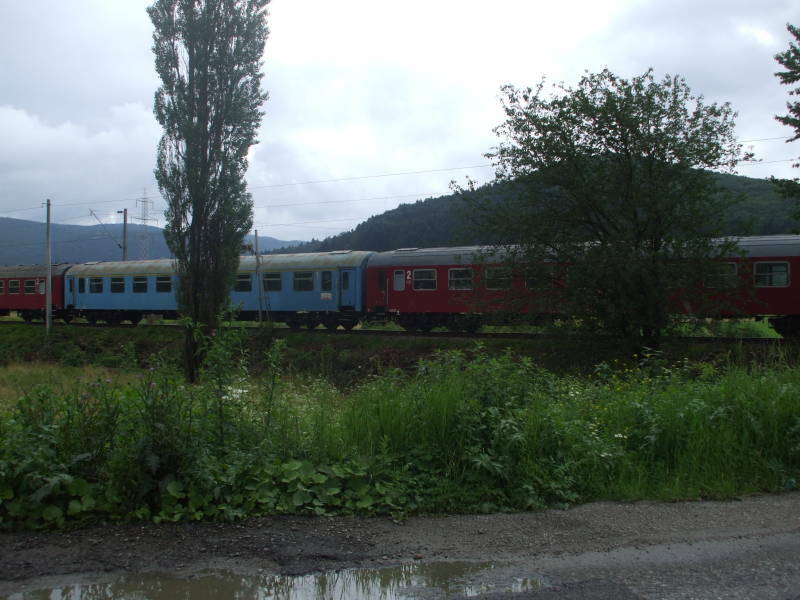 The only portion of the entire route from Athens to Paris that we did not cover by train was the short connection between Ploieşti to Braşov, although we much more than made up the missing distance by going by train from Bucharest through Ploieşti to Gura Humorului. 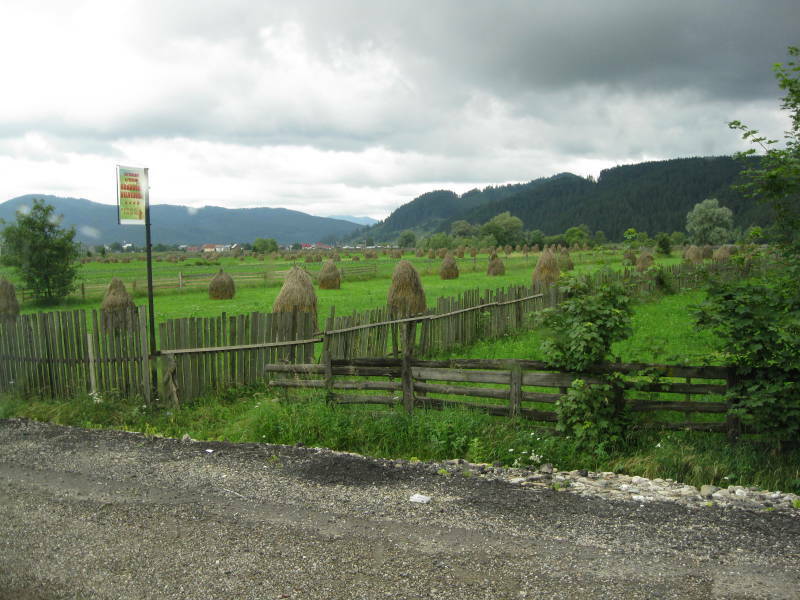 We continued in the rental car we had picked up in Suceava, west from Gura Humorului across the Carpathian Mountains along a road frequently ranked in various "Top Ten Drives" in the world. 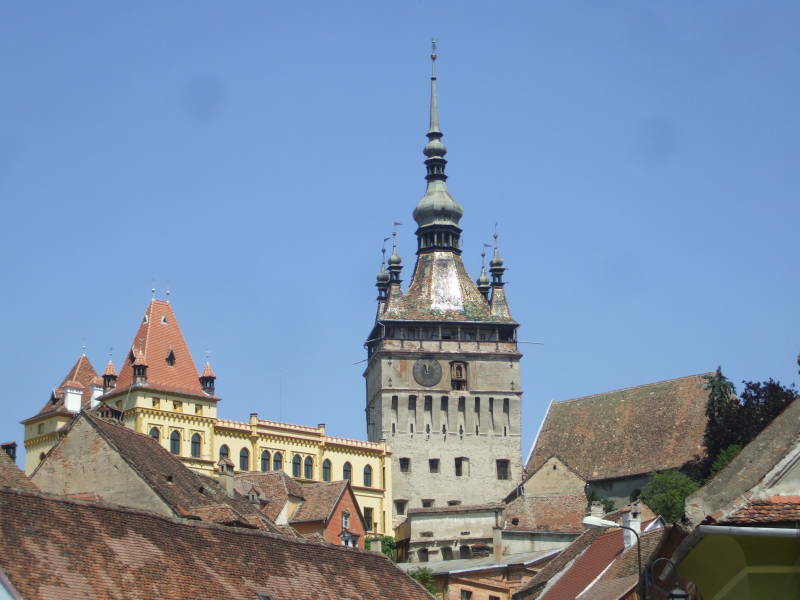 We drove to Sighişoara, spent the night there, and then the next morning two of us drove on southeast to Braşov to drop off the car, returning by train. 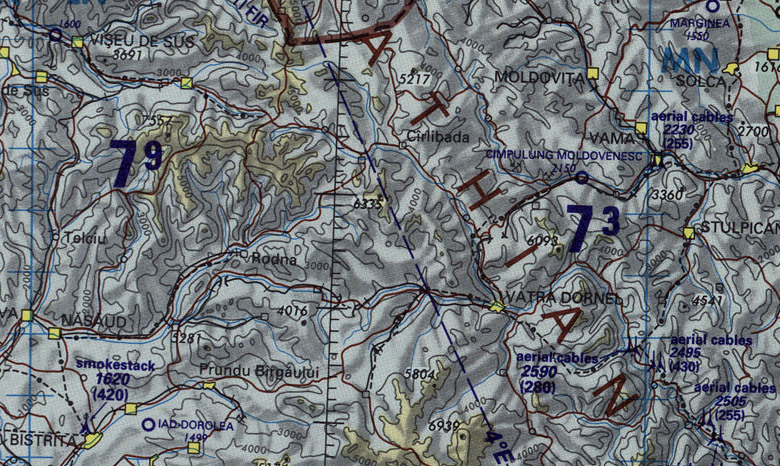 The aviation chart below shows the entire section of the drive through the Carpathian Mountains. 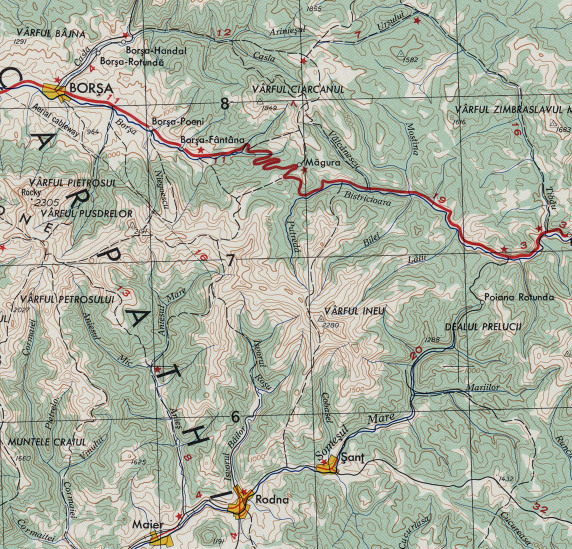 Gura Humorului, our starting point, is the unlabeled town just south of the peak marked "2700" along the right border. 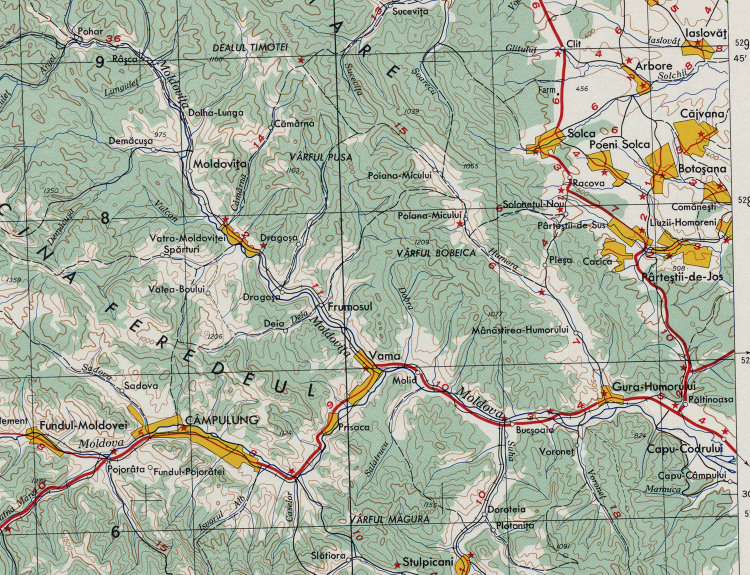 We later passed through Bistriţa, near the bottom left of this map, and then continued more or less south to Sighişoara. 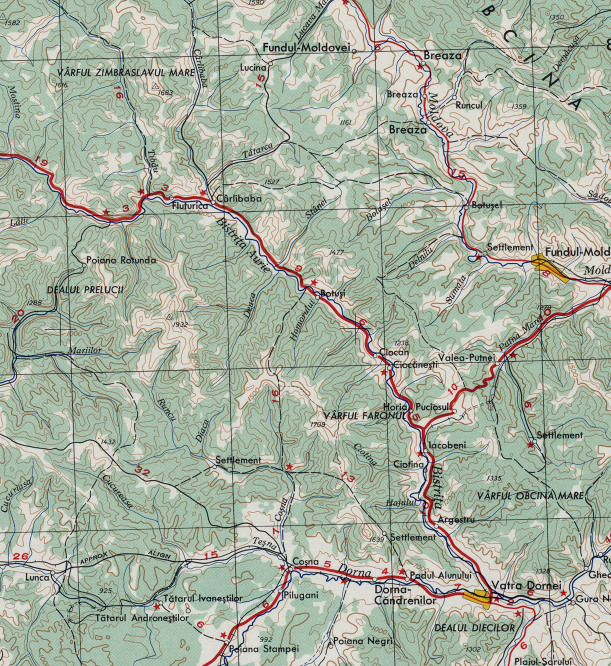 In green: The road from Gura Humorului to Sighişoara and on to Braşov. In red: The rail line from Braşov to Sighişoara. 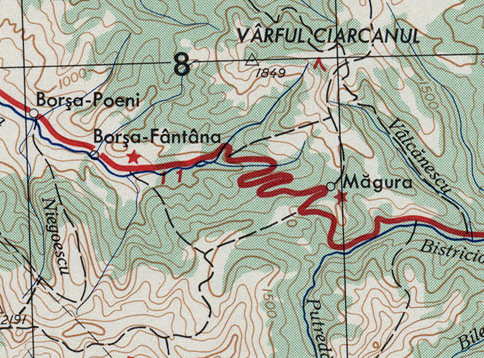 The below topographic map shows the first part of the trip in more detail: West from Gura Humorului along the Moldova River valley through Vama, turning southwest to continue through Campulung, then bearing southwest at Pojorata. 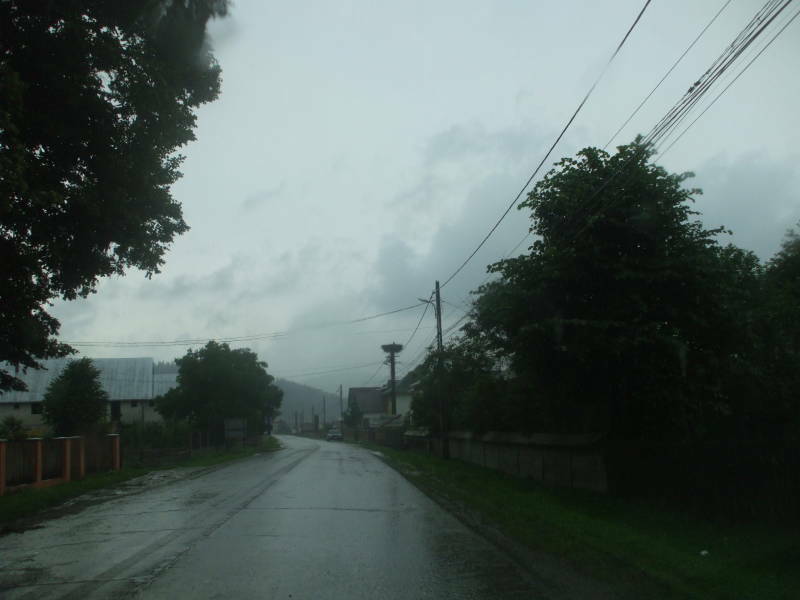 We continued southwest through Puciosul, turning north at the intersection rather than continuing south to Vatra Dornei. 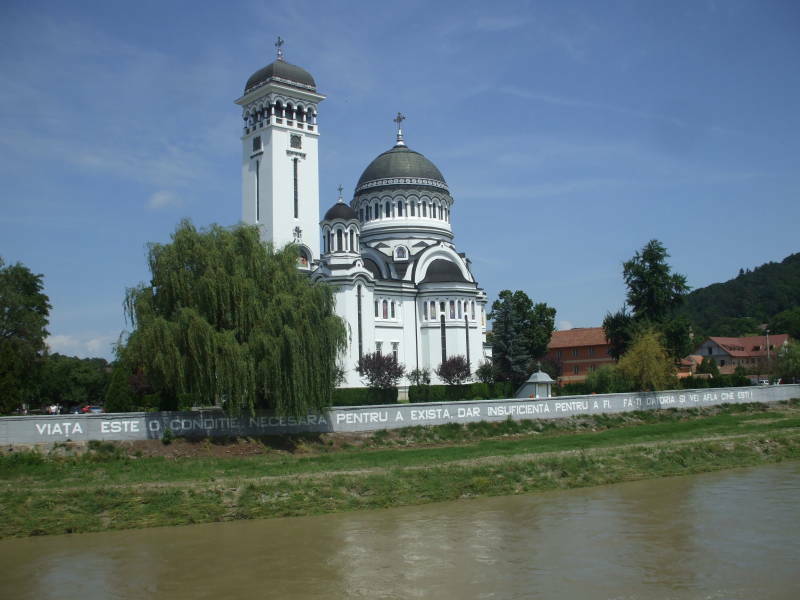 We continued along the smaller river Bistriţa Aurie through the town of Fluturica. Climbing out of the Putreda River valley brought us to the crux of the drive, the large series of switchbacks already underway at the settlement of Măgura and taking us over the pass to the Borşa River valley, which we followed to the large town of Borşa. Here is that set of switchbacks at twice the scale. I wish I had pictures of this section of the road, but this was not a route where I could drive with one hand and take pictures with the other. I did, however, do that quite a bit in other parts of Bucavina and on the earlier sections of this drive, as you see elsewhere. 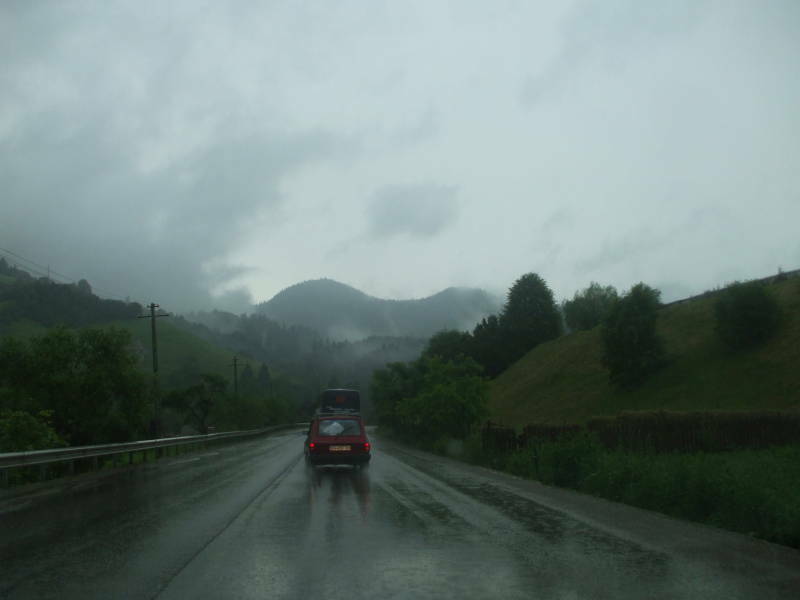 We were out of the really dramatic scenery from Barşa-Fântâna through the rest of the drive. We continued south to Bistriţa, stopped there for a late lunch, and continued on to Sighişoara. 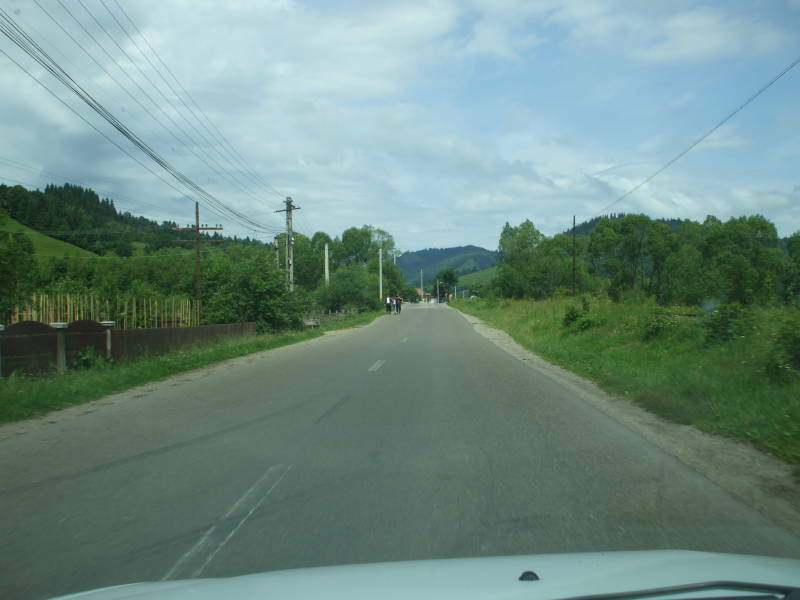 Now for some pictures of driving in northern Romania, and the drive itself. 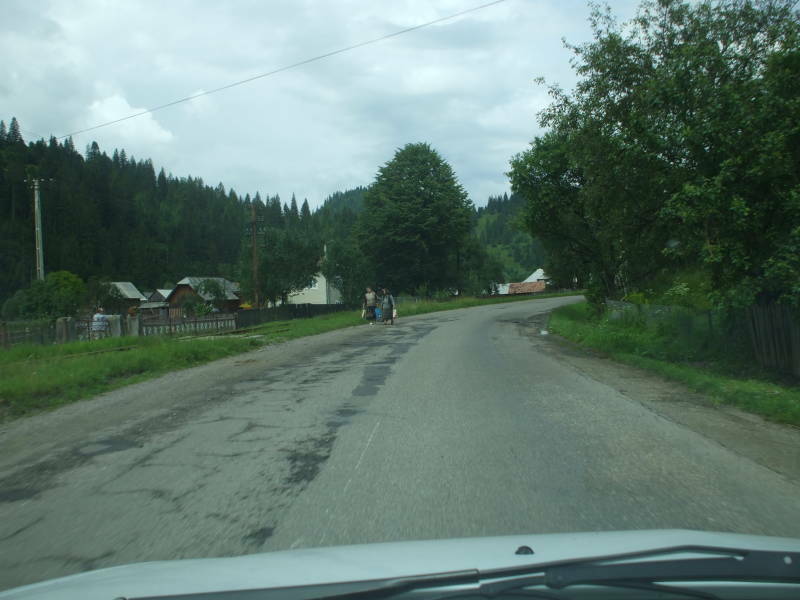 When you research a trip like this, you come across some horror stories about driving in Romania. Many people strongly discourage it, saying that it almost guarantees disaster. That's not true, as long as you keep a few things in mind and stay alert. Coming from southern Indiana, where the Amish obstruct the roads with their slow-moving black buggies, I am used to animal-powered surprises on the road. 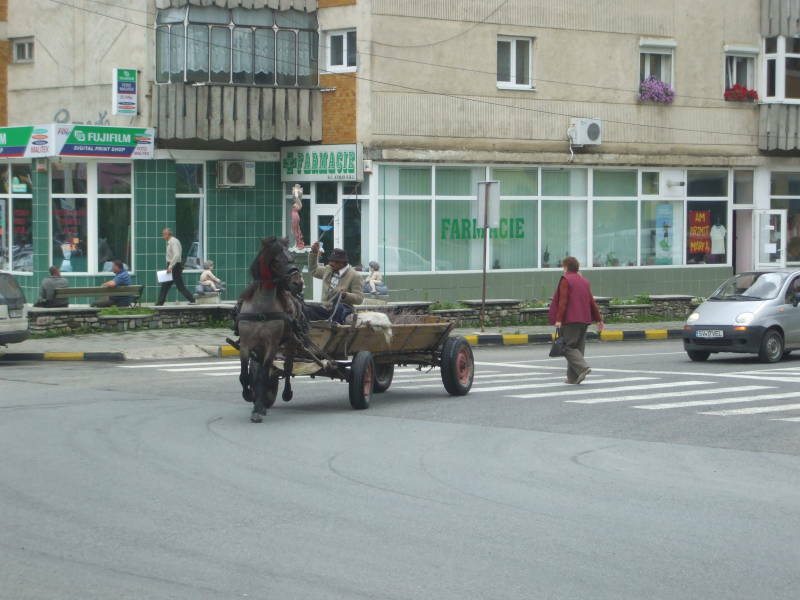 The Romanians drive their wagons in ways that are much safer than the Amish in America. For one thing, Romanians don't have religious objections to putting reflectors on their wagons. And unlike the Amish, they get their horse drawn wagons off the roads before it gets dark. 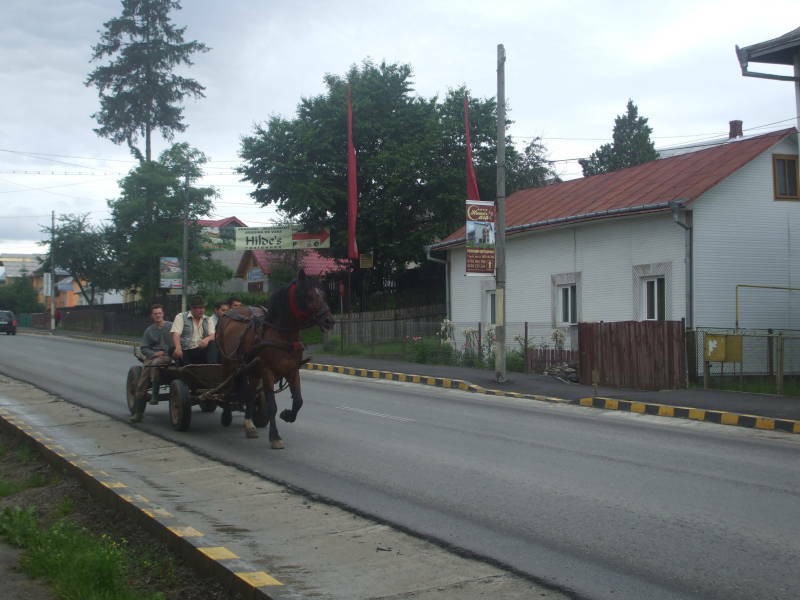 Here's a horse briskly turning onto the main road through Gura Humorului. The wagon moved almost as fast as the typical automobile through this part of town. As a visitor I found this to be an interesting sight, but it did not seem to be much of a traffic obstruction. These men seemed to be coming into town at the start of the work day. 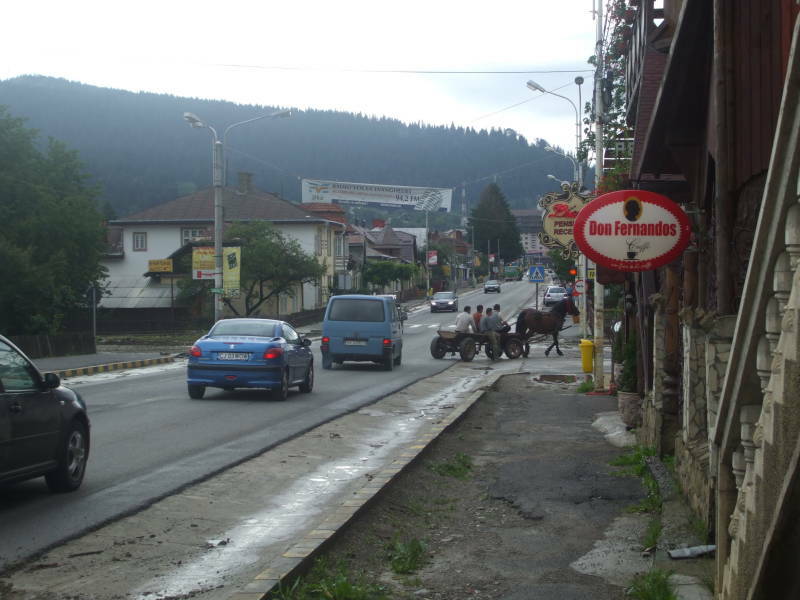 I'm looking across the road to the entrance to Hilde's, where we stayed in Gura Humorului. The wagon turned into the train station. 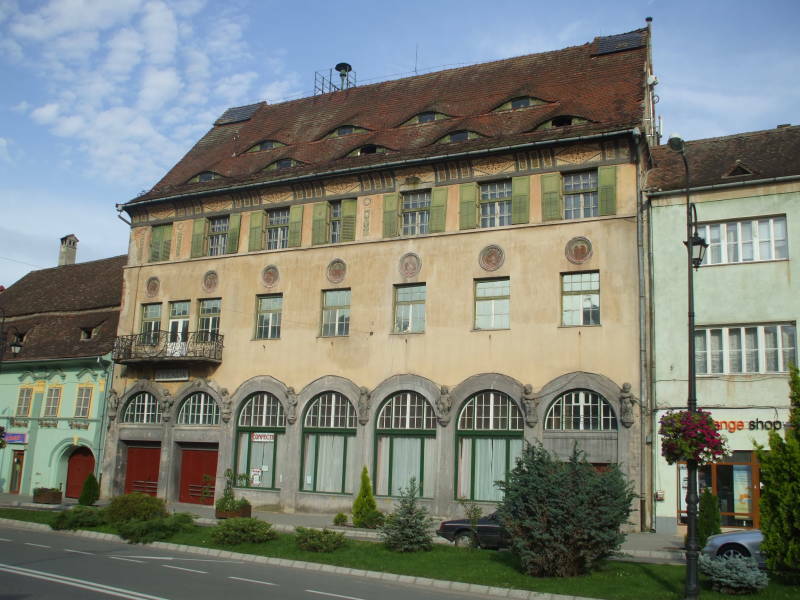 I thought that the men might be coming into Gura Humorului from out in the country, and getting onto trains to a bigger town, maybe Suceava. Some times there is no horse. This man is pushing his own wagon of sticks down the highway. 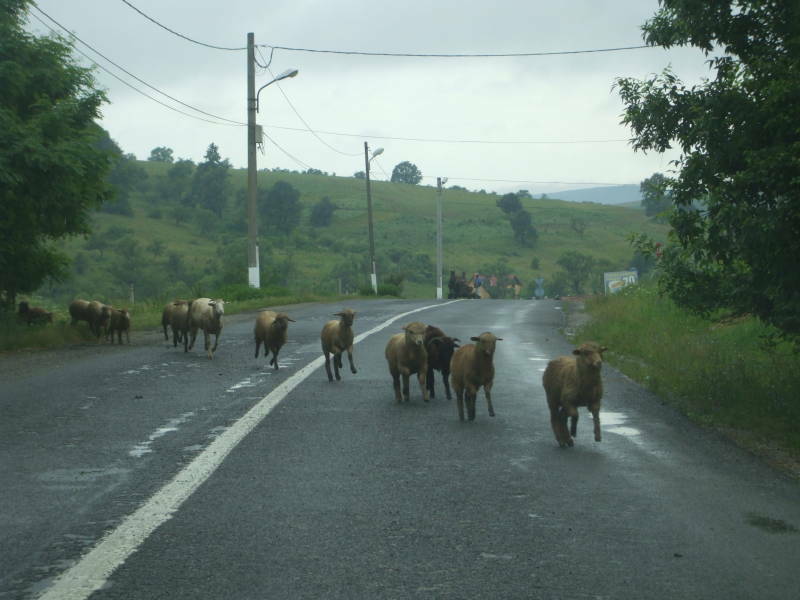 You need to be alert when driving on Romanian roads. The horror stories I had read talked at length about the animals, the pedestrians, and the potholes. I didn't really notice the Romanian potholes being any worse, any larger or more common, than what we have back home. 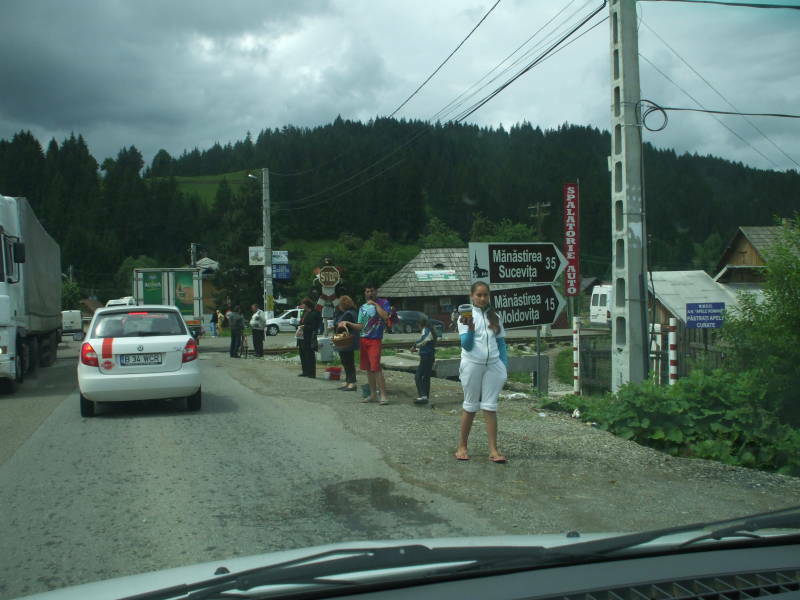 Speaking of pedestrians, you see a lot of people walking in Romania. These women are on their way home from the market. Of course, if many of the people in the community are going to be walking up and down the road, it makes sense for people to gather along the road. They can see everyone walk past, and people can stop and visit. When you can briefly glance away from the road, and the livestock, and the pedestrians, you are probably going to see haystacks. 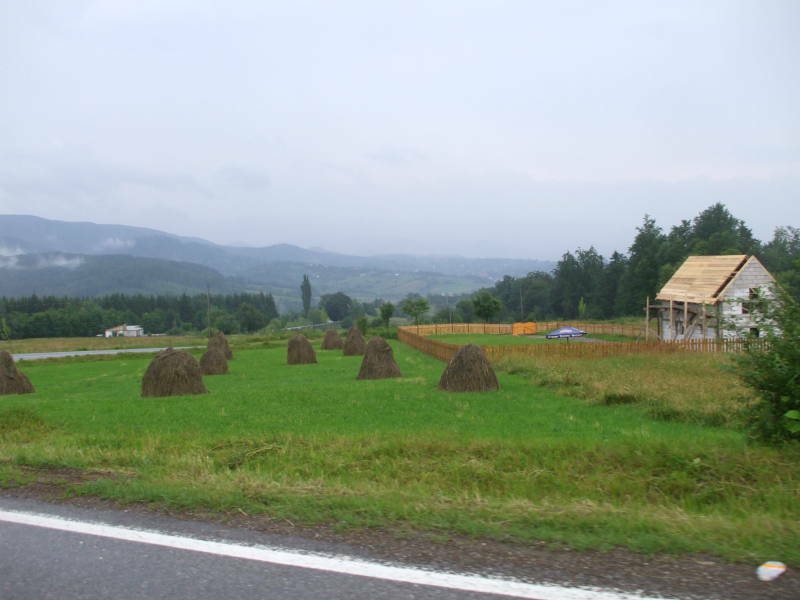 Some of the haystacks look like what I would expect, narrow mounds or pointed columns. You also see hay draped over a long board or a cord, forming a hay curtain shaped haystack. At this point you may be tired of these bucolic scenes of the countryside and haystacks. 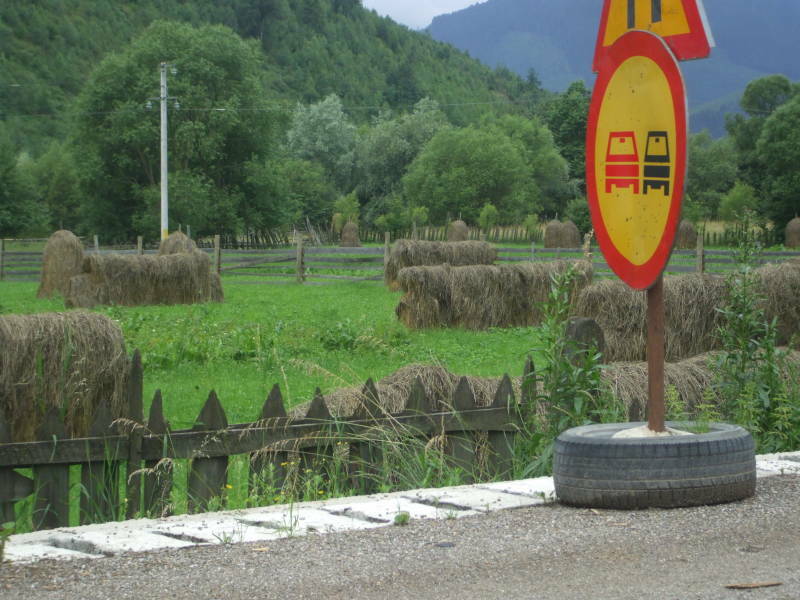 You have heard these rumors of Romanian vehicular nightmares and you want to see a problem. 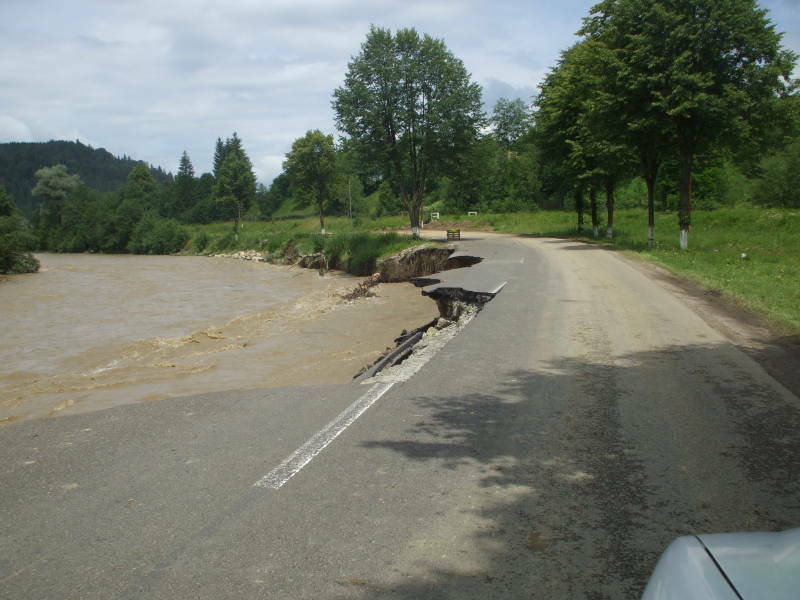 On the way to Moldoviţa we came to this section of road washed out by recent flooding. There was a police car there telling people to watch out and stay way to the one side. We got past here just fine. The flooding was unusual, people were talking about it being the worst floods in years. So you really shouldn't expect to encounter anything like this. OK, let's get on the road to Sighişoara. We will need to go west from Gura Humorului. 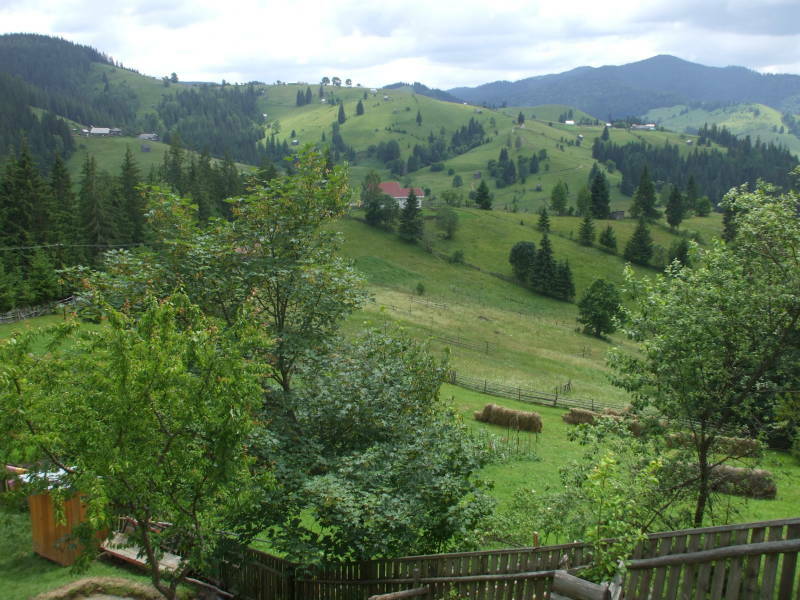 We will cross the Carpathian Mountains and then turn south to Sighişoara. 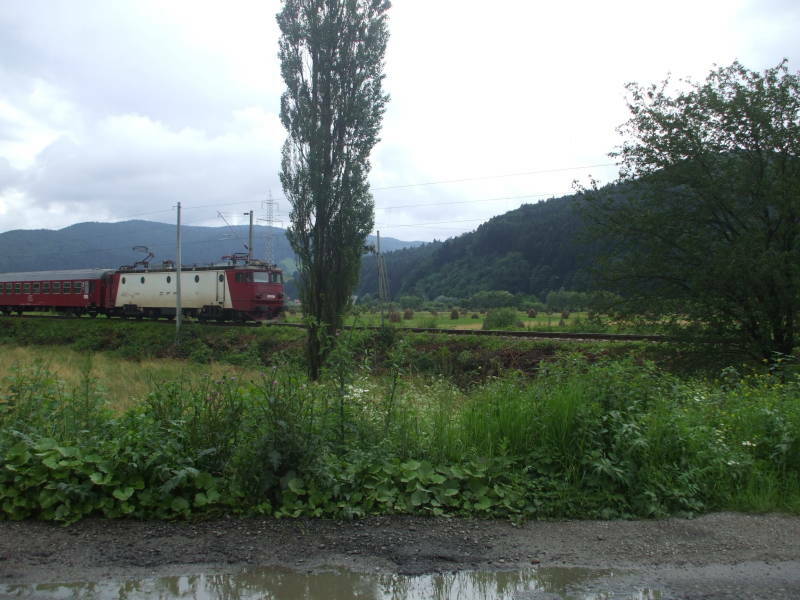 The highway running east and west through Gura Humorului runs parallel to the rail line from Suceava, and there are a few grade crossings along the way. This train will either turn north and run through Moldoviţa, or continue more to west to Campulung and possibly on to Fundul-Moldovei. Either way it will make many frequent stops along the way. If you need mushrooms or berries, you will find people selling them along the road. We are in Vama, where a smaller road turns north toward Moldoviţa and beyond. We will bear left to stay on the highway through Campulung. 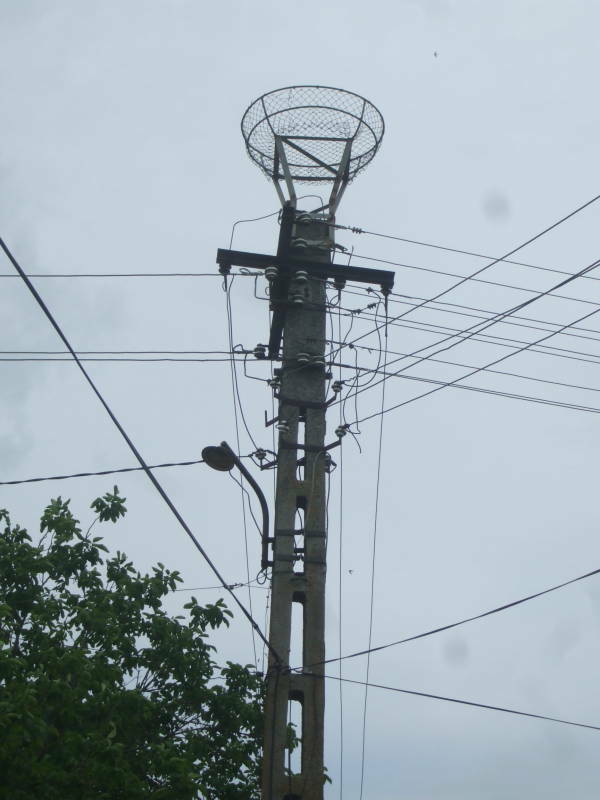 You will see large fuzzy things on the tops of utility poles in Romania. These are stork nests. Here is a stork on one of these nests. 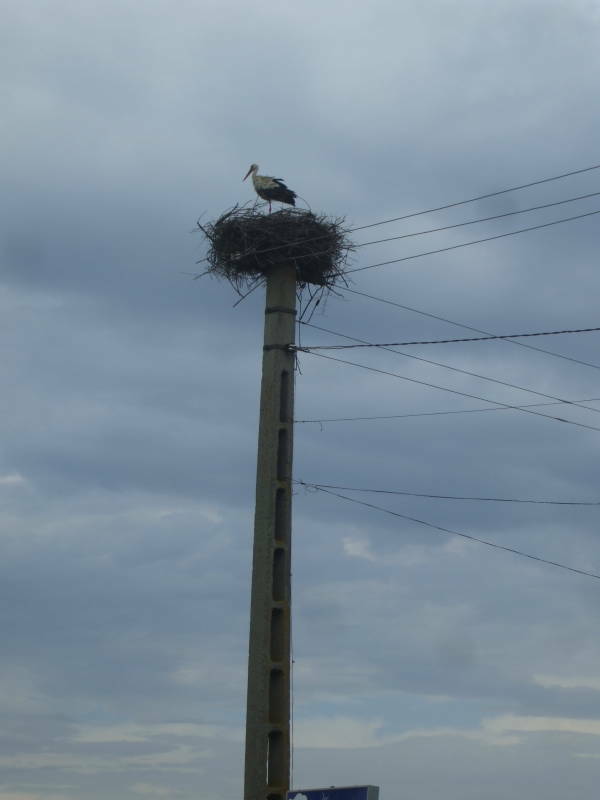 The poles come with large wire baskets intended to hold stork nests. No storks have moved into this one yet. 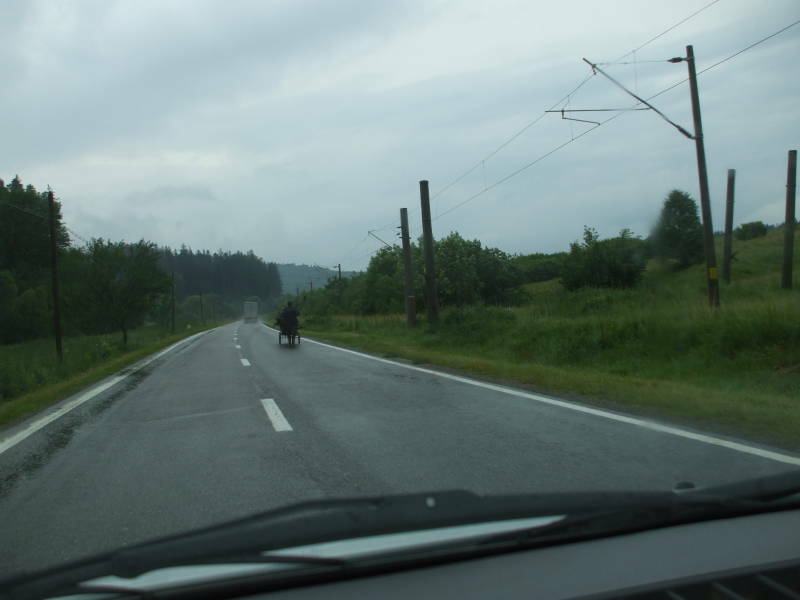 On we go, continuing on the road into the Carpathian Mountains. The mountains get larger. It was dark, foggy and raining on the day we crossed. This just made the drive more atmospheric. Brighter days can look like this in the Carpathian Mountains. The lower mountains support some agriculture. The higher ones are more solidly forested. We are heading into the region of Transylvania. 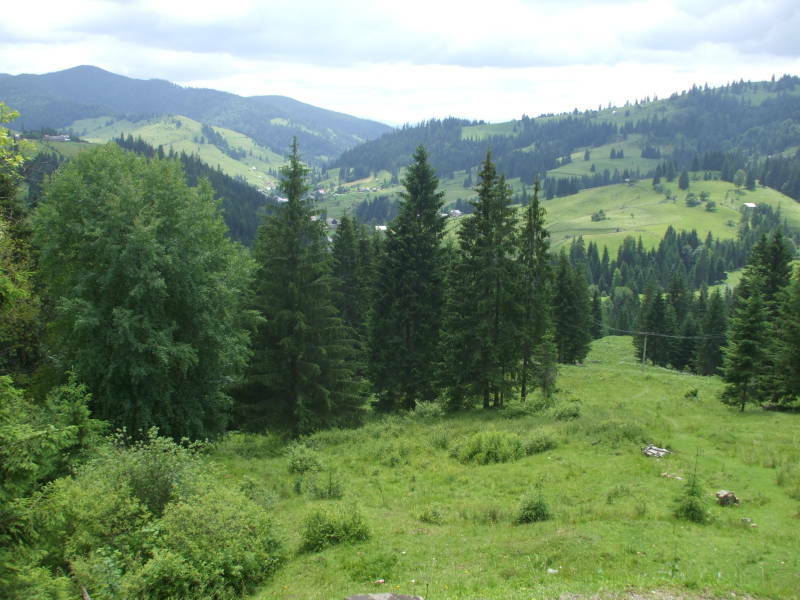 The name "Transylvania" means "through (or across) the forest", as sylvan refers to a forest. It was just too much to drive through the Carpathian Mountains and take pictures at the same time, so I don't have pictures of the most spectacular parts. You will have to go and drive the road for yourself. 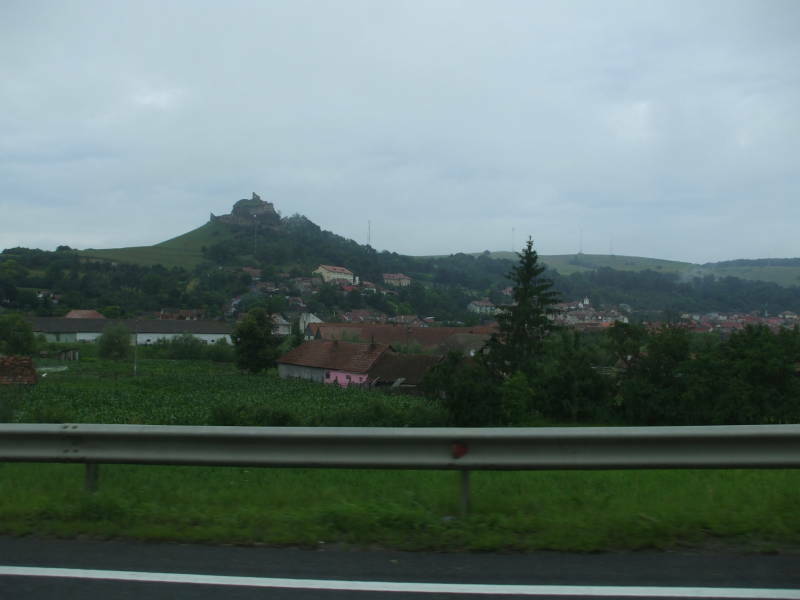 Here is a hilltop fortress fairly close to Sighişoara. 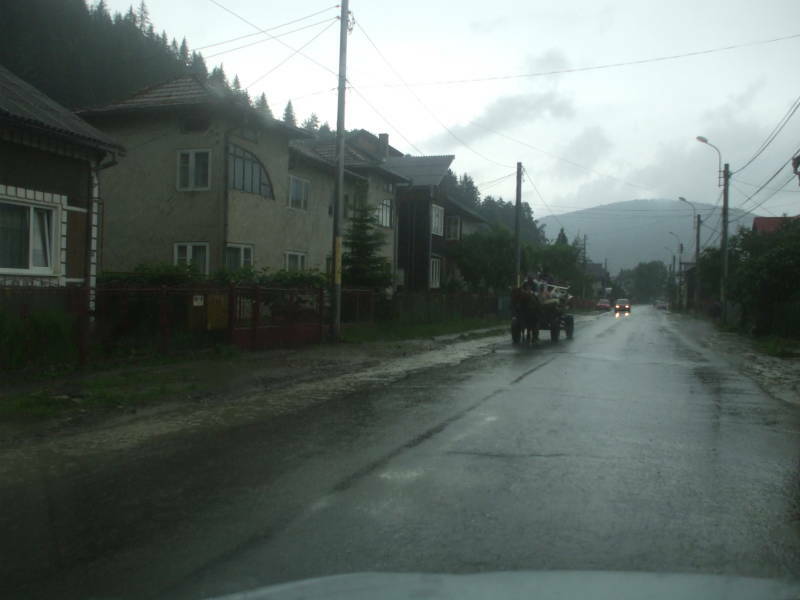 We have left Bucovina for Transylvania. We still encounter some livestock on the road. 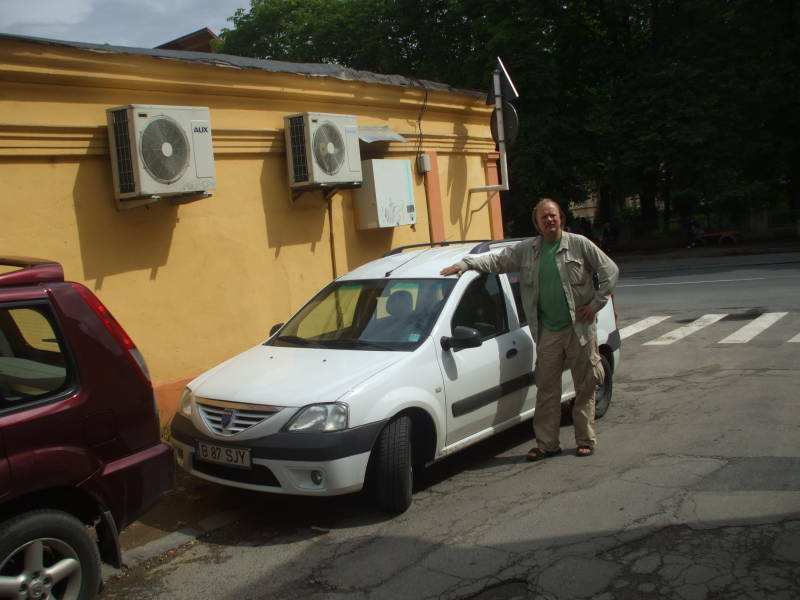 Here I am turning in our Dacia Logan MCV wagon in Braşov. We had reached Sighişoara late the day before and stayed overnight there. The next morning two of us went down to Braşov to turn in the car. 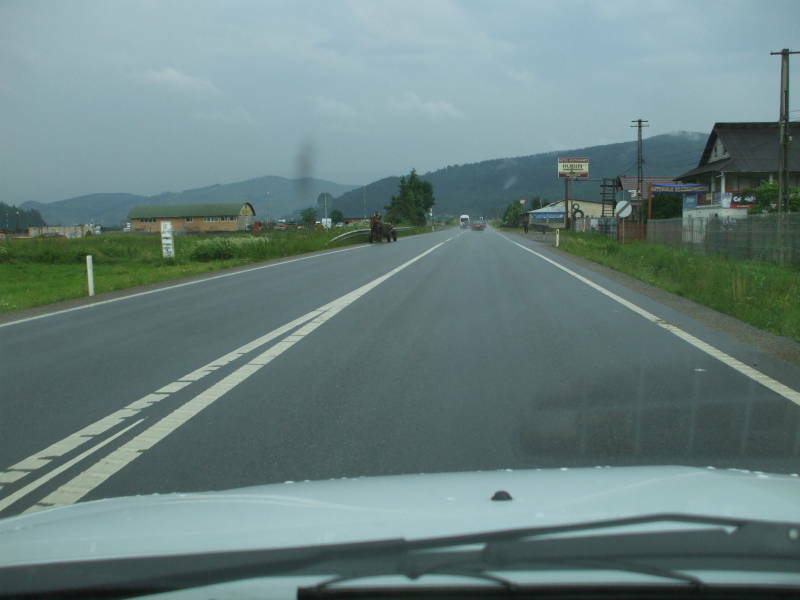 We had covered 655 kilometers what with driving around in Bucovina and then crossing the Carpathians. Turning in the Autonom rental car was as nice an experience as picking it up had been. The girl who checked it in closed the office to drive us to the train station, where we easily caught a train back to Sighişoara. 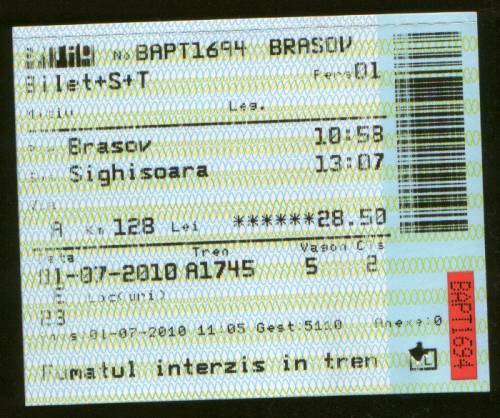 The train from Braşov to Sighişoara cost 28.53 Lei for a ride of just over an hour. Arrival in Sighişoara allows you to ask: Pardon me boy, is this the Transylvania station? 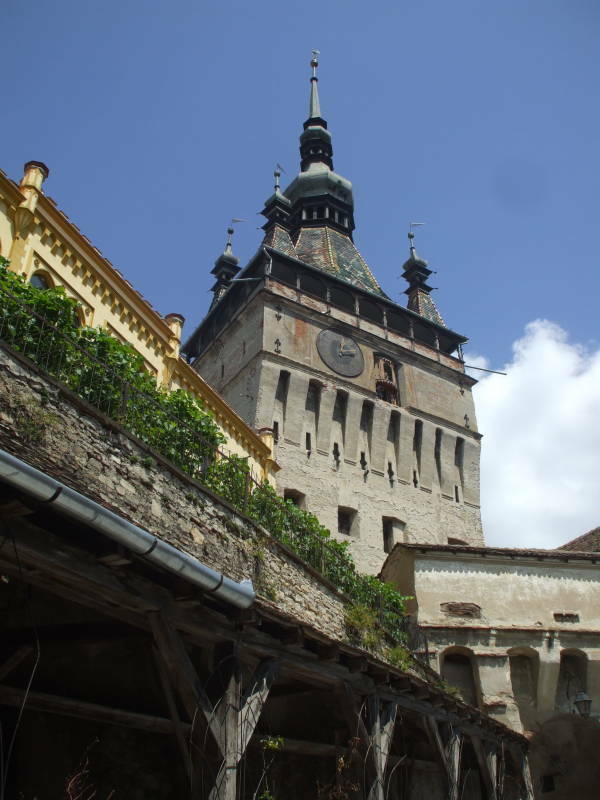 Sighişoara dates back to the 1100s, when the King of Hungary invited a group of German craftsmen and merchants known as the Transylvania Saxons to settle and defend the eastern frontier of his realm. This began the confusing part of the history of the Transylvania area. It is now in the center of Romania, but it has a strong Hungarian background and this German heritage. The Saxon merchants flourished, with 15 guilds during the 16th and 17th centuries. 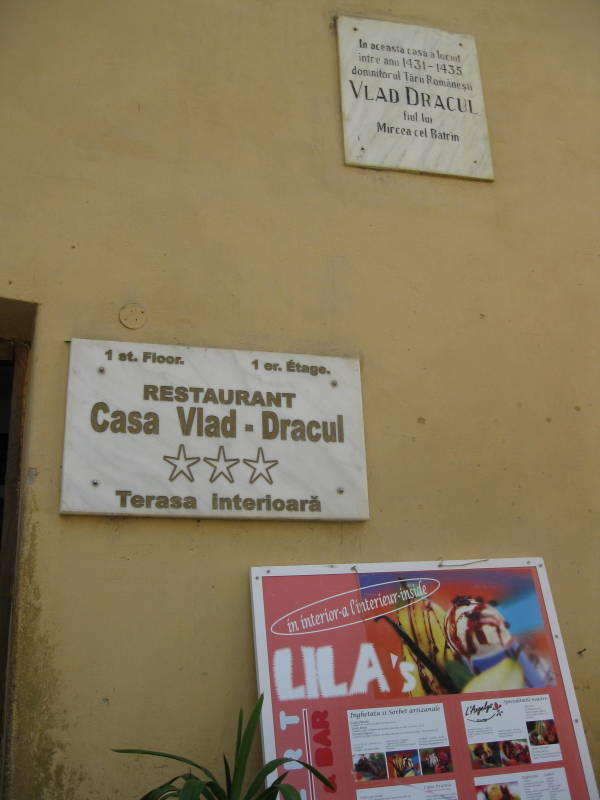 The Wallachian duke Vlad Dracul, the father of Vlad the Impaler, popularly known as Dracula, lived here in exile. 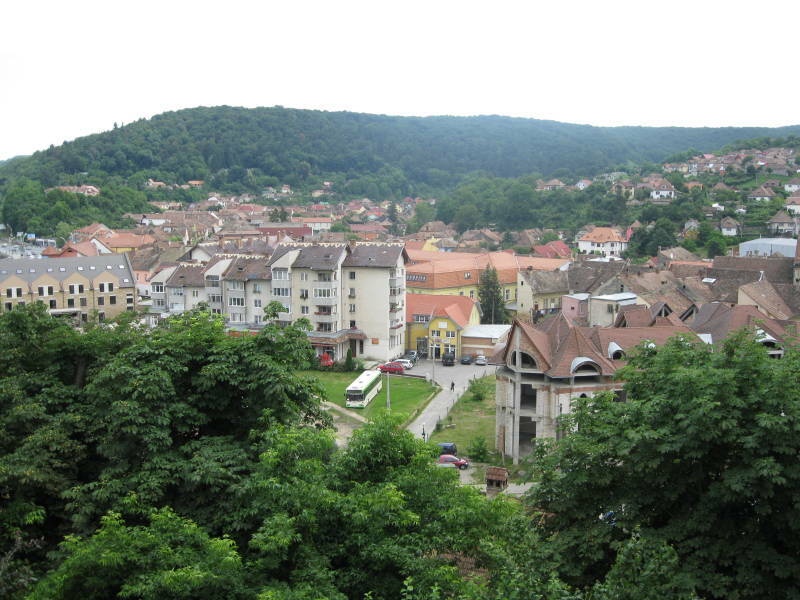 He issued the first document using the Romanian name Sighişoara for the town, derived from the Hungarian Segesvár. The city remained part of the Hungarian empire, being part of Austria-Hungary in World War I. After the end of that war, Transylvania and Sighişoara was transferred to the Kingdom of Romania. 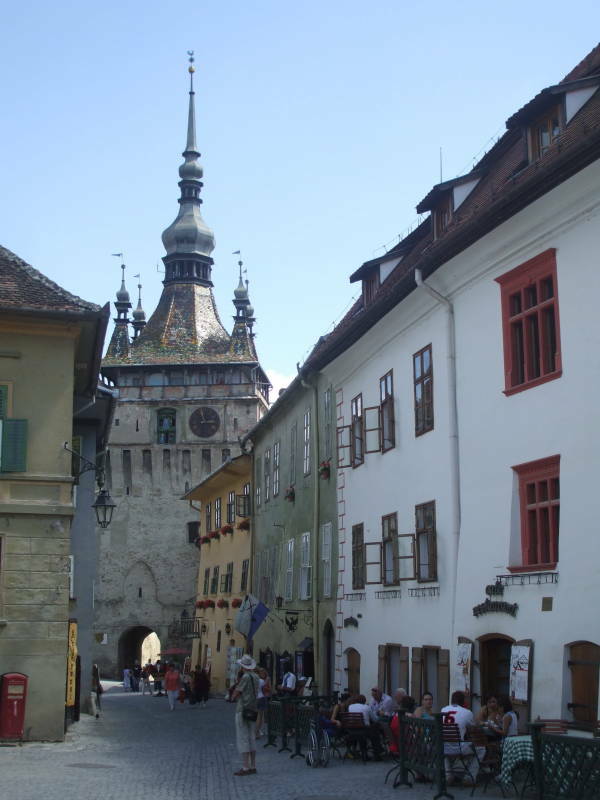 Sighişoara had a Romanian name (based on a Hungarian one), so it kept its same name. 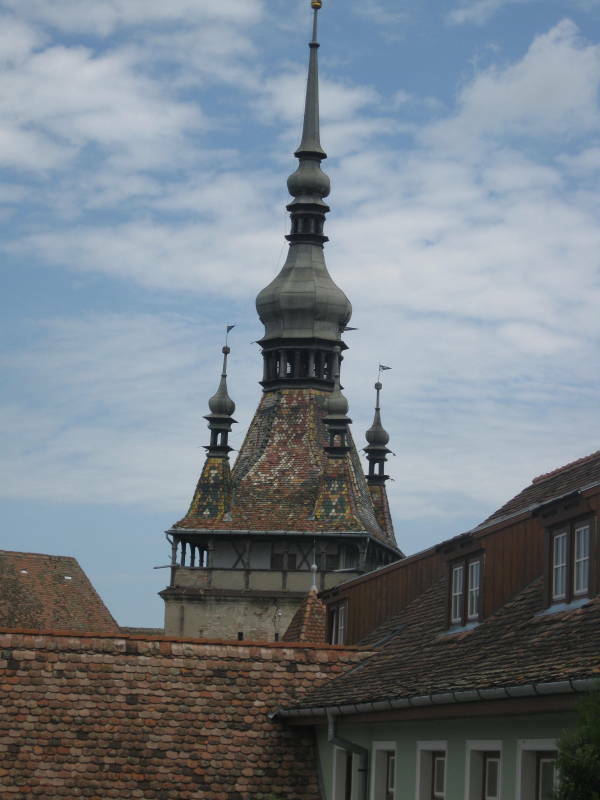 Sibiu, another Transylvanian city, was formerly known as Nagyszeben when it was in Austria-Hungary. Central Sighişoara is recognized by UNESCO as a World Heritage Site for its example of a very well preserved small medieval fortified city. The 64 meter Clock Tower, built in the 1200s, is the primary landmark of the city. The medieval walled stronghold, known as Cetate or the Citadel, is on top of the hill. The lower town is along and in the valley of the Târnava Mare river. An even newer part of the city lies across the river from the citadel. This area has a memorial to the town's men killed in World War II. Post-war politics meant that it was built by the Soviet Union, so the main part of the monument is inscribed in Russian, with secondary parts in Romanian and Hungarian. Vlad II (c 1393 - 1447) was known as Vlad Dracul, meaning Vlad the Dragon. He was a duke or prince of Wallachia, a region largely in today's southern Romania and partly in northern Bulgaria. The Romanian name was Ţara Românească, or Цѣра Румѫнѣскъ as they would have spelled it back then. Wallachia was founded as a principality in the early 1300s after a rebellion against Charles I of Hungary. In 1415, it accepted the suzerainty of the Ottoman Empire, meaning that it became a tributary with some limited domestic autonomy while the Ottomans controled its foreign affairs. That situation continued until 1859, when it united with Moldavia to form the basis of modern Romania. Vlad II came to be called Dracul after being inducted into the Order of the Dragon, a chivalric order founded in 1408 by the Holy Roman Emperor Sigismund, part of a plan to gain political favor for the Catholic Church and protect Wallachia against the Ottoman Empire. Vlad II reigned 1436-1442 and 1443-1447. That one-year gap occurred when he had gone to the Ottoman court to negotiate for support from the Ottomans against some Transylvanian forces. Mircea II seized power in Vlad's absence and was in turn ousted by Basarab II, who then was ousted by Vlad II who had returned with an Ottoman army as backup. Among his other deals with the Ottomans, Vlad II had given them his sons Radu the Beautiful and Vlad III, later to be known as Vlad Ţepeş or Vlad the Impaler, to serve as hostages guaranteeing (maybe) his cooperation with the Ottomans. Vlad III was known as Dracula as it's simply a patronymic for "Son of Dracul". He ruled Wallachia from 1456 to 1462, spending much of that time in military campaigns against the Ottoman Empire's expansion. The Ottomans had finally captured Constantinople, renamed İstanbul, in 1453, and they continued to expand into the Balkans. He was infamous for his cruelty, impaling captured enemies in numbers estimated from 40,000 to 100,000. Soon after his death, his likeness began to be used for cruel rulers or executioners in art. He made guest appearances as Pontius Pilate, the Roman proconsul of Patras who oversaw the crucifixion of Saint Andrew, and others. Later, around 1550 and some 75 years after his death, people began referring to him as Ţepeş or The Impaler. His brother Radu had been easier for the Ottomans to control. Radu converted to Islam, was given the honorable title Bey and given command of Janissary contingents. Vlad, however, had been imprisoned and frequently whipped and beaten for his stubborn behavior and verbal abuse of his trainers. Vlad eventually came around somewhat to the Ottoman point of view, although it's believed that his hatred of them and his enthusiasm for impaling them go back to their treatment of him. He was released from imprisonment under probation and educated in logic, the Turkish and Persian languages (both of which he would speak fluently in later years), the Quran and other literature, warfare and horse riding. Irish author Bram Stoker used the name "Dracula" in his 1897 novel about a vampire from Transylvania. It was based on his research, Stoker never visited the area.